With a used centrifuge, a used decanter or used separator solids are separated from liquids, or liquids with different densities are separated. Due to the high drum speed, the heavier parts are forced to the outside by the centrifugal force and discharged from the centrifuge. This used Dewatering Technology comes mainly from municipal and industrial sludge dewatering. The used decanter centrifuge are in good used condition. Some of them have already been dismantled and stored. 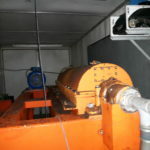 But often the used decanter centrifuges are still in operation and can be viewed at the customer site. A Two-Phase-Decanter Centrifuge is a continuously operating horizontal centrifuge. It consists of a rapidly rotating drum and an inner slower rotating screw. Here the solids are steadily discharged with the internal screw from the centrifuge drum. With a Three-Phase Decanter Centrifuge, also called Tricanter, a continuous three-phase separation is possible. This means the separation of two liquids having different densities and a solid phase. Please contact us at if you can not find a suitable used decanter centrifuge.